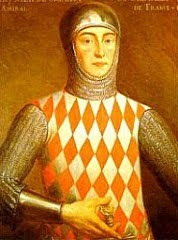 Seigneur Rainier I is best known as the founding father, so to speak, of the Princely Family of Monaco. He was the first official Lord of Monaco but spent much of his time in France where, as readers of this blog will know, he became a grand-admiral of France for his contribution during the wars of King Philippe IV against England and Flanders, particularly the great naval victory in Zeeland in August of 1304 where he captured the Flemish admiral Guy de Namur whom he carried in triumph back to Paris. However, he was also, in addition to being Lord of Monaco, the Lord of Cagnes and it was as Cagnes-sur-Mer, in what is now the Alps-Maritimes department in France, that he built the formidable Chateau Grimaldi. Standing tall and imposing on a hill overlooking the town, the castle was built from local stone with fortified walls, bastions, towers, an imposing keep all centered around a triangular courtyard. There had been fortifications on the hill going back to the Roman Empire and even the ancient Greeks before Seigneur Rainier I built his castle there in 1309. Later, during the reign of King Louis XIII, the castle was modified to be a more livable residence rather than simply a military structure. During that time the artist Genois Carlone painted the great hall of the chateau with a scene of the fall of Phaeton from Greek mythology. Today the Chateau Grimaldi still stands, to a large extent as it was when Rainier I of Monaco built it but with a more peaceful occupation. 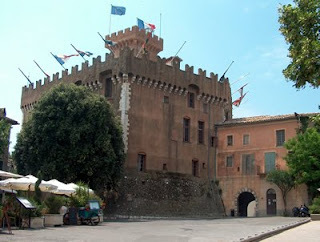 Officially known as the Grimaldi Castle Museum it houses an impressive art collection including pieces of mostly contemporary and modern art. It is safe to say that a fighting sailor like Rainier I would be quite surprised to see his imposing fortress used to display modern art.